Looking for huge, dark red flowers? Look no further than Henry Bockstoce. Truly everything about this peony is enormous. The bud can grow to a big 4.5 cm and the flowers can, when fully in bloom, reach a diameter of 18 cm. Henry Bockstoce is a double-flowered peony that blooms in the shape of a rose. The petals, like the stems, are thick and sturdy. 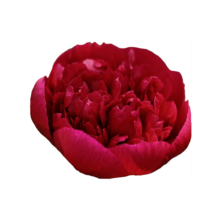 Of all red peony varieties, Henry Bockstoce is one of the newest varieties. Only the peony variety Old Faithful is younger. This peony variety was bred in the United States in 1955 by peony breeder Bockstoce. It is a hybrid of the common peony and the lactiflora. Henry Bockstoce is a huge, dark red peony that has to be showing some colour to be able to open. Don’t cut it too early! This powerhouse of a peony has a vase life of about ten days.